Do establish daily goals. What do you want to accomplish today? Or throughout the week? Write down your goals. Make sure those goals are specific and actually realistic. The worst thing you can do is set goals that are too high and too hard. That only leads to disappointment and procrastination. Don’t do the most. When setting your goals, don’t overdo it. 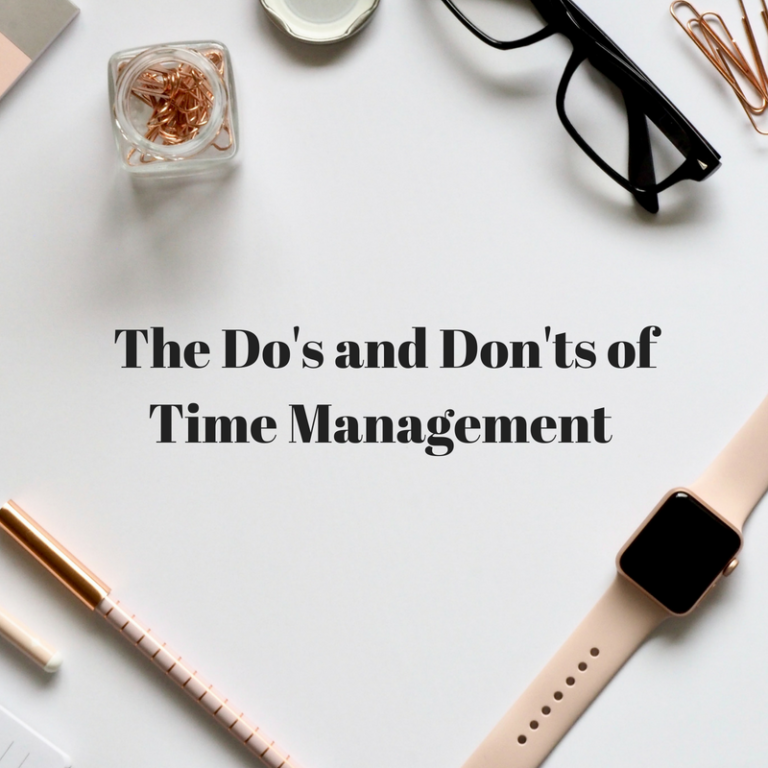 Taking on too much isn’t time management, it’s additional and unnecessary stress. Additionally, your work will often become sloppy when you have too much going on. If needed, say no or ask for help. Do create a to-do list. Take those goals and put it into action. A to-do list should consist of specific tasks that need to be done. I prefer to even put the specific times in which I plan to work on each task. This allows you to know exactly what to focus on throughout your day. Even better? Prioritizing the list in order of what must be done to tasks that could potentially be left for the next day. Do take breaks. Don’t make your day jam-packed with tasks. Although you have a to do list, your day should still be treated as flexible and a break is well-deserved. Walk away for 10-15 minutes. Take a walk, get some water, talk to a friend. Take a step back from being busy. Don’t get caught up in distractions. Most emails, texts and notifications don’t require an immediate response. The occasional glance is totally fine, but don’t get caught up in a 30 minute scroll through Twitter and IG. This is where DND comes in handy. Keep the focus on the task. Do end your day with listing your accomplishments. What’s better than knowing you got work done? List out or check off your goals that you’ve completed each day. Take this as a moment of positivity – you did it! Don’t let time management be all work and no play. Being busy 24/7 is not fun nor is it something to be proud. Constantly being busy appears that you’re unable to work under time constraints and may not have the desired work ethic. Be sure to manage your time and, of course, ask clarifying questions and seek help if you can’t get everything done when you need it. And remember, it’s very unlikely to ever have all your time under your control. Be flexible. Drop your time management tips below!